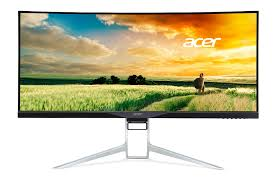 Acer just announced the XR341CK, an ultra-wide curved monitor featuring a 34-inch QHD panel with AMD FreeSync™ technology in a zero frame design. The sleek 34-inch curved zero frame design lets gamers absorb visuals comfortably without blind spots. It also provides maximum viewing area and is perfect for multi-monitor setups and daisy chaining for an even broader view. Thanks to an ultra-high QHD (3440×1440@75Hz) resolution, pictures are amazingly sharp and realistic. FreeSync, AMD’s version of Adaptive Sync technology, allows the GPU to control the display’s refresh rate to eliminate tearing and stuttering, and reduce mouse latency, which enables smooth gameplay at virtually any framerate. The IPS panel delivers accurate colors up to 172 degrees horizontally and 178 degrees vertically. For thrilling sound effects, two 7W speakers with DTS® Sound enrich games with dynamic, world-class audio. An adjustable aluminium stand provides optimal comfort with ergonomic tilt from – 5 to 35 degrees and height adjustments up to 5 inches. A cable management hole keeps cables organized and out of the way. Wall mountable, it can save valuable desk space.